Until the end, he decided to travel around the world. When in Italy, Gilbert eating delicious foods and enjoy life. Later, she went to India to find a real spiritual. She ended up in Bali, to find a balance between eating, prayer and love. In keeping with the title of his book, Liz is studying "a good meal" in Rome in the first chapter of her novel. In the second part, the reader is invited to learn meditation ala India. Contemplation to organize the soul does for 4 months in Assam. At the end of this, Liz vividly recalled how he finally met Felipe, the Brazilian who also fell in love with Ubud, and of course fell in love with Liz. Liz met with Ketut Liyer, the Balinese (spiritual teacher also a medicine man) who gives enlightenment to Liz, so finally Liz find peace. Thanks to the advice and prayer from Ketut Liyer, Elizabeth Gilbert finally back alive, and find true love. Liz's experience has been filmed, titled the same as the novel. Julia Roberts plays Elizabeth Gilbert with very good acting. Have you watched this movie? If you are curious about the story, just buy a novel or movie that you can get on DVD and Blu-Ray. If you watch this film, you will see the beauty of the island of Bali. You can see the scene in Ubud Art Market, Padang-Padang Beach, and some of the beautiful location. Padang-Padang Beach is now known as Julia Roberts shooting on the beach. On the beach Julia Roberts doing romantic scenes with Javier Bardem (Oscar winner). You also get to see the power of Javier Bardem's acting in the latest James Bond movie, Sky Fall. This beautiful beach located on the southern island of Bali. 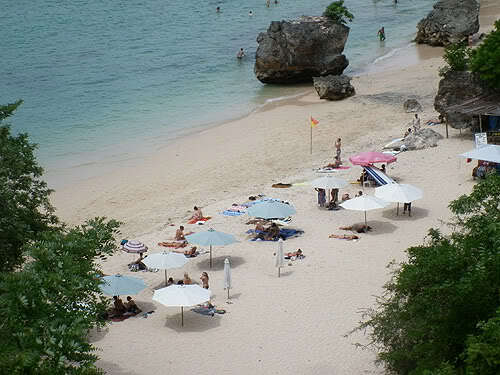 Now Bali is not only known for the beauty of Kuta beach, Sanur beach and Nusa Dua. 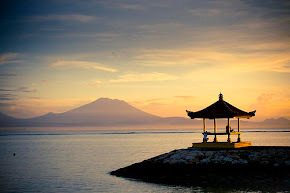 Honeymoon in Padang-Padang also the best choice for you. Elizabeth Gilbert's journey from America, Italy, India and Bali is a journey of the difficulties of modern life, love and spiritual. If you want to find peace, you do not have to travel so long as Liz to find true love. You simply go to Bali. In this tropical island you can eat, pray and find love. If you have enough time, find peace with yoga in Ubud or other places in Bali. In addition to yoga, you will also be taught about meditation so that you can raise the "Kundalini" and find the "Chakra" that had been hidden in your body and your soul. You can also consult about real life with Ketut Liyer as ever undertaken by Elizabeth Gilbert. The story of spiritual conversations between Ketut Liyer and Elizabeth Gilbert will be found in the movie "Eat Pray Love".